Substitute plans take time, and when you are sick or absent for an emergency, who has time to make up lesson plans. So, behold, I give you what I left my substitutes. This served great purpose and also allowed me the freedom to leave plans without having to do a lot of work. I would leave a "substitute binder" that had photos of my entire classroom explaining how to turn off lights, expectations, and the flow of our classroom. I would also leave the following letter to whoever subbed for me. Then, anytime I was gone, the sub could go to this binder and find all the necessary information all ready for them instead of me having to take time to make new plans each and every time. Sources in the binder included: year-long lunch duty schedule, all drill dates, drill procedures, classroom photo tour, emergency numbers, etc. 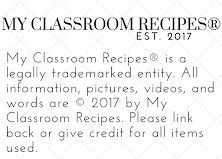 If I couldn't make it into school, I would leave a message with the secretary telling them to have the sub go to www.myclassroomrecipes.com and click on the "sub plans" page to find all the lesson plans. Please use the sub binder left on my desk; this will be your source for all duties, procedures, and picture explanations on how to run all aspects of my classroom. Located on this page is the video or plan left for you to follow for the classes. Let the dates be your guide and follow all instructions. Thank you much! Sub Binder: This binder will offer you anything you need to know to be my substitute. Please pay attention to the duties, i.e. lunch duty, to see if there is something extra you need to do. All drill information is also provided. **If you need rosters for each class for emergency reasons, there are lists for each class in the pocket of this binder. Projector: The remote is the small gray one. Push the green ON button and the projector will beep and the green light will come on. Behavior: Students are trying to earn classroom money so please let me know how the students behave. Signal: All my classes respond to silence signals. Say “Red Robin” they respond with “yum”. 1st hour: Planning period. Jane Doe is my student aid. First, she needs to finish writing the grades in my grade plan book located on the pink filing cabinet. Next, she should sort the graded papers in the mail boxes. Lastly, she needs to do clean the tables, vacuum the carpet, and do the magnets. When she finishes these, she should go through the containers with all the supplies (paint, glue, post-its, etc.) and organize them all nicely. For you, it will probably be best if you go through the lesson video described in this lesson plan for 3rd hour. 2nd Hour: This is my reading class. Usually, they have library day today but 6th grade has MAP testing, so the students will be working on the continuation of their interactive notebooks from yesterday. The kiddos know exactly what they are to work on, and should be able to finish by the end of the hour, but nevertheless, here is an explanation so you can remind them. They need to cut out the “making inferences” boxes (there are 3). Next, they should color them and then should glue them in their notebooks. Lastly, they should complete each box for the story of “The Little Mermaid’ which they have copies of from reading last week. **In this class you will have James Rhoades. He has just had a battle with seizures the last week. If in this class he has a seizure, send all the students down to the library and call the office immediately (2100). 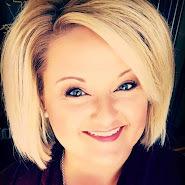 **Jen Leftwich will be in here this hour as SPED teacher, and she is a great source to refer to for help or guidance. This is my English class. I have the entire lesson recorded for you. All you have to do is push play and pause in the appropriate places. The opening screen HAS TO BE UP ON THE PROJECTOR since it is the starting message for the students when they enter the classroom. Please make sure the video is FULL SCREEN and paused, so the kids can use the first 7 minutes (maybe longer if needed) of class to complete word Wednesday. Throughout the video, you will need to pause it. The final product of the lesson should look like the paper fortune teller example on my desk. **The video for this is minimized in Chrome at the bottom of the screen. If this gets closed out, it is located on my website. 4th Hour: Repeat of 3rd hour’s directions. 5th Hour: Repeat of 3rd hour’s directions. 6th Hour: Repeat of 3rd hour’s directions. 7th Hour: This is my drama class which is downstairs in my drama classroom (located across from the computer lab). The students have been working on our play Little Mermaid. To get the class’s attention say “drama” and they will respond with “llama”. Say it back to back and the students will cease talking all together and be ready to go. Please instruct them that since I am gone today, they will start the play from the top and perform each scene. They will probably make it about a third of the way through the play.